Enlightenment writers, revolutionaries, and even Napoleon discussed and wrote about France's tiny Jewish population at great length. Why was there so much thinking about Jews when they were a minority of less than one percent and had little economic and virtually no political power? 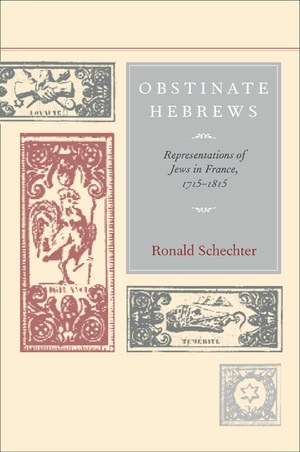 In this unusually wide-ranging study of representations of Jews in eighteenth-century France—both by Gentiles and Jews themselves—Ronald Schechteroffers fresh perspectives on the Enlightenment and French Revolution, on Jewish history, and on the nature of racism and intolerance. 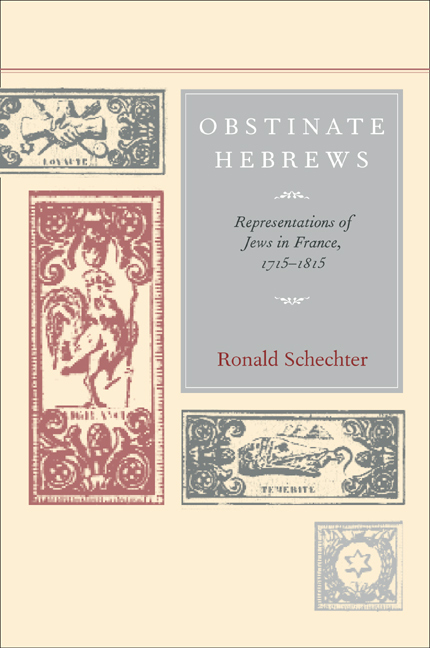 Informed by the latest historical scholarship and by the insights of cultural theory, Obstinate Hebrews is a fascinating tale of cultural appropriation cast in the light of modern society's preoccupation with the "other." Schechter argues that the French paid attention to the Jews because thinking about the Jews helped them reflect on general issues of the day. These included the role of tradition in religion, the perfectibility of human nature, national identity, and the nature of citizenship. In a conclusion comparing and contrasting the "Jewish question" in France with discourses about women, blacks, and Native Americans, Schechter provocatively widens his inquiry, calling for a more historically precise approach to these important questions of difference. Ronald Schechter is Associate Professor in the Lyon Gardiner Tyler Department of History, The College of William and Mary. He is editor of The French Revolution: The Essential Readings (2001). Conclusion: Jews and Other "Others"